Well guys I finally got my display base done.......Here's a few pics. I'm not just saying what I'm going to say just were Friends, nor that were New Friends, nor the fact that your building a Dirt Modified for me !! I just want this to be known to everyone. 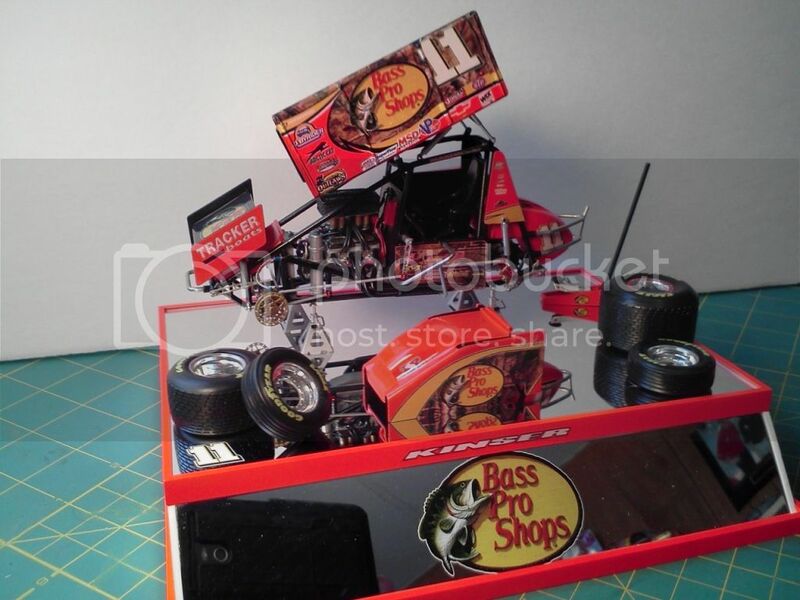 I think that this is the BEST Sprint Car that I've ever seen, and that your Diorama Stand is just plain out of this World, what a Fantastic Set up! This really is a the best setup that I've seen in a very long long time. Thanks for all the kind words, Mike & Joe! yeah I'm really happy with the way everything turned out. 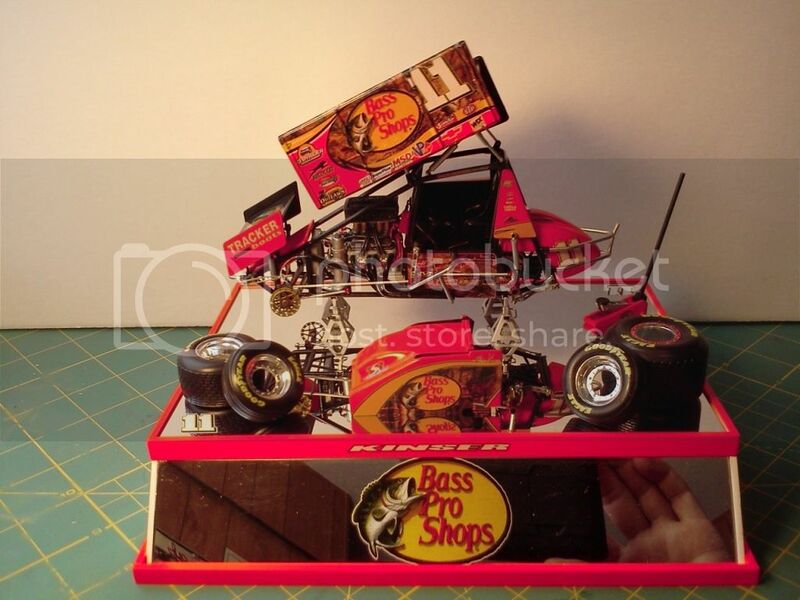 It was a fun build, can't wait to build Kraig Kinser's car soon. I have been burning the midnight oil on the late model build for Mike I'll be posting some pics soon of my progress on that project as well. Joe's decals for these sprint cars are awesome! Could'nt have done this car without your decals JOE! 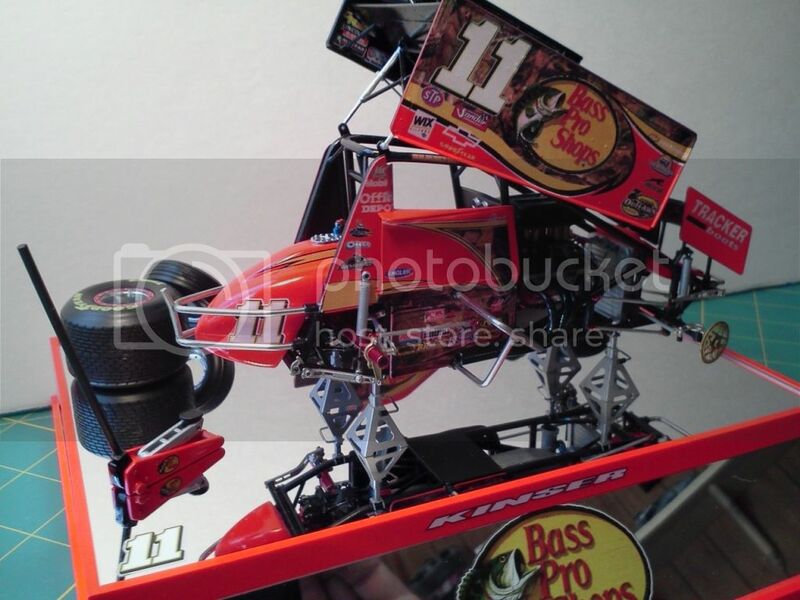 Bill, go ahead with the other Kinser Car, it'll be awhile yet before I can get the Screws!! Damn!!!! That looks good. Nice build. Awesome build!! The base really finishes it off!! Nice job!! AWESOME JOB! LOOKS PERFECT AND THE STAND SETS IT UP PERFECT. I LOVE THE LOOK OF THE CAR SETTING UP WITH THE WHEELS OFF.I HAVE TO ASK WHAT COLOR RED DID YOU USE?